The newly renovated auditorium at Southern High School is welcoming students to audition for "Fame -- The Musical" this afternoon. 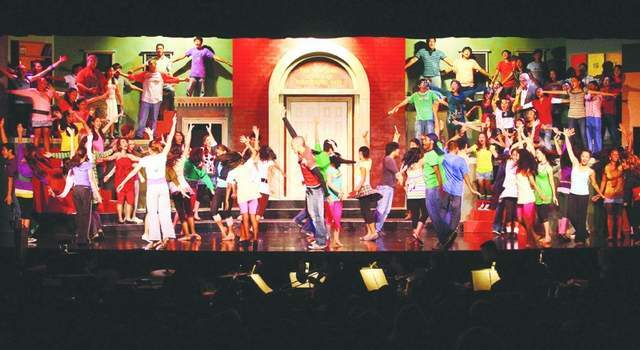 The Santa Rita school's auditorium is the new home of the Gifted and Talented Education theater program, which is producing the show. For the program's alumni, the program meant lifelong friendships and unforgettable experiences. Kimberly Gogue started participating with the GATE theater program when she was in high school. "The people that I met during the different shows, we've been friends since then," she said. It's been 14 years since Gogue joined the program, but now the legacy of GATE has been passed down to her daughter. Gogue volunteered to run the sound for some of the recent productions, and she said Ray Twenter, director of the program, taught her daughter to do the same. "I don't think they realized how much they influenced us as individuals," Gogue said of Twenter and fellow director Ann Gorby, who've been a part of the program for at least two decades. Gogue said that everyone should participate in producing a play at least once. "It looks easy, but it takes a lot of dedication," she said. "The rewards you get from putting in the time and effort are phenomenal." With the renovation of Southern High, the GATE theater program will open a new chapter of encouraging young adults to express themselves through the drama and art. After decades of performing musicals, dramas and other shows on the program's stage in Tiyan, the building was closed earlier this year for fire code violations. For Twenter, the closure was bittersweet. "Anne (Gorby) and I and the staff back in '95 ... we transformed that from a Navy movie house," Twenter said. "Last year, it was melancholy because we'd worked really hard on that facility; at the same time, watching the auditorium at Southern being renovated, we were able to let go of the Tiyan facility without having lasting emotions about it."